A young artist’s dream just came true after she got to give her artwork to her favorite athlete. Lily, an 11-year-old with a love for the Milwaukee Bucks got to meet her favorite player, Giannis Antetokounmpo, at an autograph signing. As the Greek Freak signed Lily’s jersey for her, she handed him a purple folder containing her artwork. 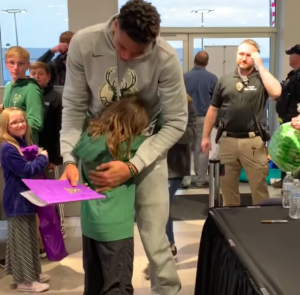 The basketball star hugged and thanked Lily and told her that he thought her art was “amazing.” Overcome with emotion over meeting Giannis, Lily began to cry tears of joy. Lily’s father says she created the artwork just for Giannis; she worked on those pieces for a year and a half. Lily’s creativity and dedication definitely paid off! Read more. For kids with disabilities, it’s hard to imagine ever having the opportunity to ski, but it’s becoming possible with the help of one charity. Kids of Courage takes sick children and young adults with disabilities to the slopes so that they can enjoy skiing like everyone else. Before joining Kids of Courage’s trip to Vermont, 8-year-old Azzie Warum had never been skiing, but after skiing for the first time, he says that he felt like he was in a race car. Avi Davidson, a 25-year-old who lost his arm and the use of his legs, believes that going skiing has allowed him to overcome obstacles. Read more. With Payless closing their stores, a young woman from Kansas decided to use their going out of business sale to help those in need. After realizing that the shoes only cost $1, Addy Tritt thought it’d be a good idea to buy 204 pairs and donate them to the people of Nebraska who have been affected by record-breaking flooding. After negotiating a purchase price of $100 total, she sent the shoes to the Sigma Alpha sorority at Fort Hays State University, who donated them to the Future Farmers Association chapter in Wilcox, Nebraska. Tritt enjoys collecting donations for local charities, and she says that donating brings her “so much joy.” Read more. A Texas art teacher’s creative ensemble has gone viral after her daughter posted a photo of her wearing her students’ artwork. 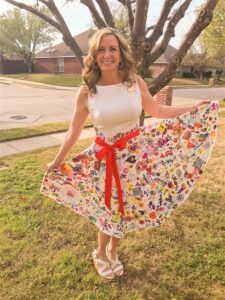 Rebecca Bonner asked her students to draw pictures on the skirt of her white dress and wore it to art shows hosted by the school and by the district. There are 580 colorful doodles of hearts, flowers, dogs, and more on the dress that Bonner proudly wears. She loves collaborative projects and is planning on starting another “doodle dress” with the students who didn’t get to add their creativity to her outfit the first time. Read more. In a heartfelt show of appreciation, nearly 800 elementary school students sang happy birthday to their beloved janitor, Haze Mabry. Mabry was shocked by the celebration, which involved banners and handmade birthday cards. The chant, “Mr. Haze! Mr. Haze!” echoed through the student-lined hallways as Mabry made his way down the corridor where he’s worked for the past 13 years. Mabry is known to be a kind, attentive voice to the students who all wanted to remind him on his birthday just how loved he is. Read more.